If you mean the map fonts, @2x is currently the biggest that the providers have. FP2 apparently has 446 ppi, so, yes, @3x or @4x maps would be a better fit. And, yes, labels rotate along with the map since we're using tiles. Vector maps would allow fixing that, but vectors are not in sight. I cannot install on 2.0.4, any suggestions? The only installation problem I've seen people have is outdated repository database. Try "pkcon refresh". a silly question: Can we add waypoints to PoorMaps Navigation? If yes.. how? No. Maybe it should be added, but it's a hard problem. ok, one workaround would be to import GPX files, but I don't find that option either. It's a great app however, but for biking and other activieties I like to do my own routes. so, to my understanding, PoorMaps do not import (or export) any GPX data. Correct? Correct. GPX-import has been requested before, but I haven't yet done anything about. I filed an issue to not forget about the matter. 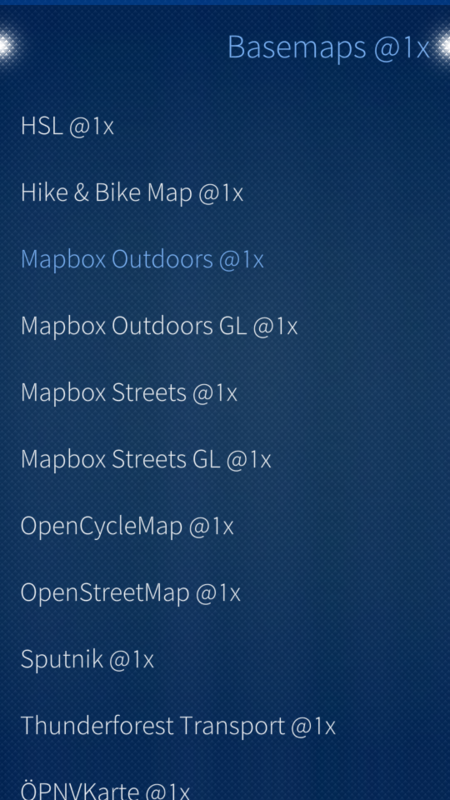 Note that Poor Maps saves and restores routes from route.json and maneuvers.json files in ~/.config/harbour-poor-maps. They are not any standard format files, but really simple JSON files. While waiting for me to add an import feature, it would be fairly easy for anyone with basic programming skills to write a conversion script and just copy JSON files in the directory. The UI and scaling changes you made in this version are perfect. Looks amazing on Fairphone 2! Hi, thank you very much for this great app. Is it possible to use maps of "openseamap.org" to? Yes. It's called an overlay in Poor Maps. 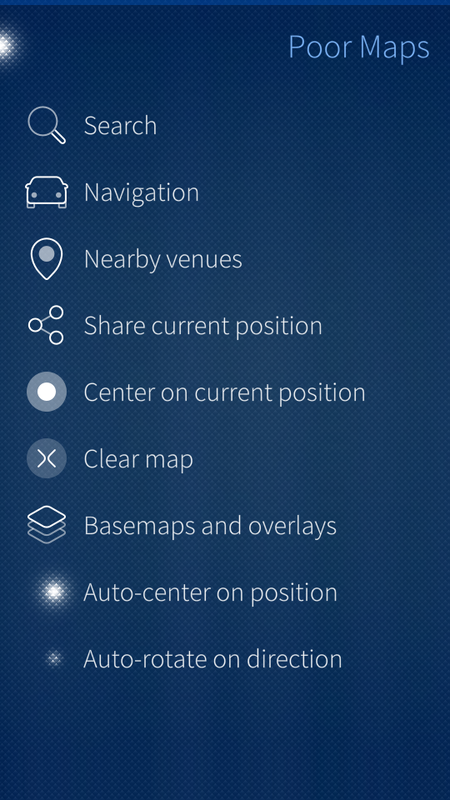 Go to the main menu, select "Basemaps and overlays", swipe left and right to move between the list of basemaps and the list of overlays. This is really great. I have a suggestion for UI though. 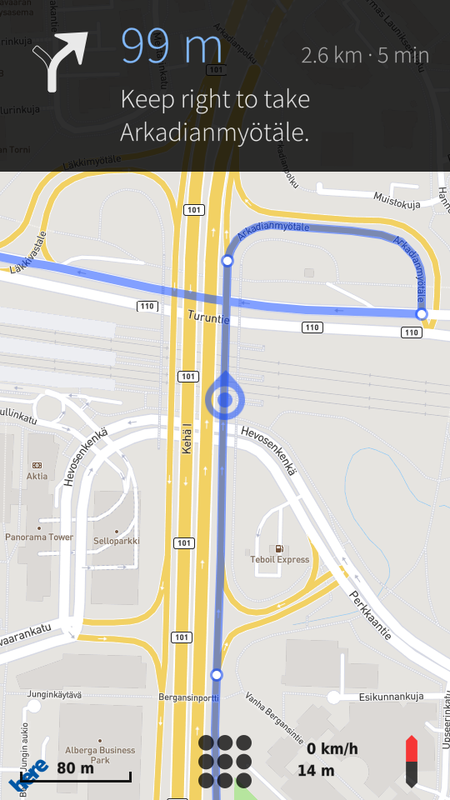 Is it possible to change the colour of route while in navigation mode? Sometimes I think a green route would be better recognizable than the blue one. And: the directions are shown in an overlay that has dark background and light font color. In sunlight this is almost unreadable. I think a light background and black font would be better. And last but not least: the overlay takes some place depending on content. The current position is always centered in relation to full screen. Could it be possible to center the position only within the visible scope between lower border of text and bottom of display? Anyway: thanks for your efforts. The app is great! You can't change the route color. It's difficult to make dynamic, since the maneuver and node points along the route are PNG icons and for it to look nice, especially given the transparency, the colors need to match. Either way, I expect this is such rarely needed that it's not worth the UI. Blue is an obvious choice as most maps have blue for water, hence not much else, and most routes are on land. The direction overlay is dark, because that's how Sailfish is in general. I follow the theme as much as I can. I agree on auto-centering, it's a known issue, but I haven't fixed it yet. I filed a bug report in order to not forget about it. May we help with translations? I could offer german. Translations are not yet possible, it needs some background work. 0.23 does not install, neither from RPM. Sounds like the package database is not up-to-date with respect to the packages on the server. This is clearly no problem with Poor Maps. I don't know what to do about it. I recommend searching or asking either on together.jolla.com or the Warehouse thread on TMO. helped, now it works fine! Thank for your app. 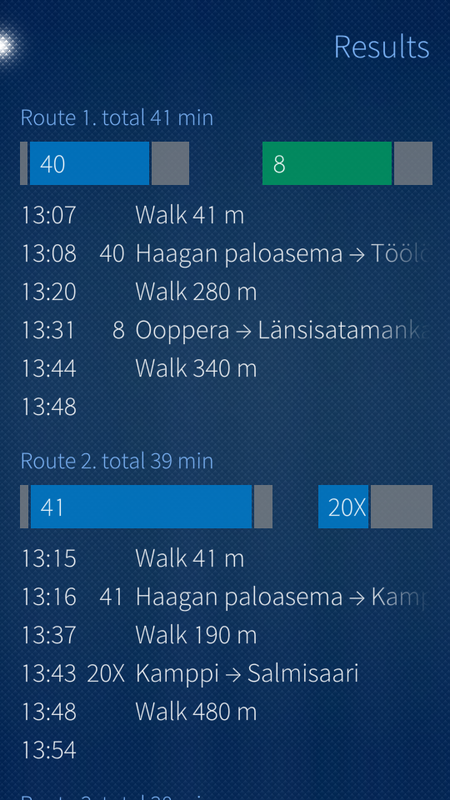 The best navigator for Jolla Sailfish. Only one thing: Is it possible to use bigger font size for the speed on the map display mode? And, why not, to add it on the "widget" mode. After that, it could be perfect. Also, I can help you for a French translation if you are interested. I mostly added the positioning accuracy and speed meters for debugging reasons. I could bump the font size a little (also for the scalebar value), but if you're looking for something like mapsspeedometer.com, then no. Regarding the cover, speed wouldn't be useful there, because Poor doesn't keep positioning on when you switch to another app or turn off the display. As a result, the positioning will jump around when you activate positioning again by returning to the cover view and the speed values might be all over the place. Translations are not yet possible, it needs some background work. If it seems that Sailfish is still alive and devices on the markets, I'll get to that eventually. Thanks for this app, too. It is of great importance if Here maps will not be allowed to use in the mobile phones anymore due to the intresses of the car factories. Therefore it should be very wellcome to port Poor Maps to Jolla Store. 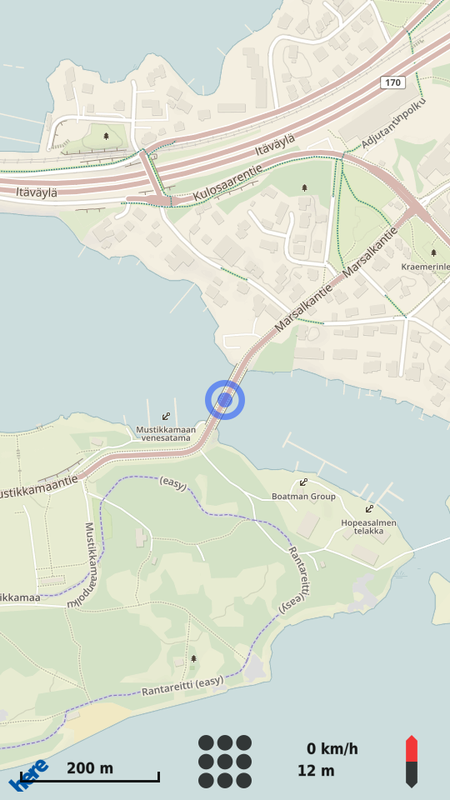 Poor Maps uses QtLocation, which is not yet allowed in the Jolla Store due to not being a stable part of Qt. QtLocation is a "tech preview" module in Qt since 5.5, no other timeline given. It could be several years still before it's stable in Qt and several more years before Sailfish OS upgrades to that Qt version. The situation with QtLocation and the Jolla Store is weird considering it's used by Jolla's own map application, it's clearly the most native and smooth solution for maps with Qt (better than the legacy map components modRana etc. bundle) and it's well on track to being stable. It's very unlikely to be removed from Sailfish OS and given the maintainer is very conservative, I don't expect big API changes. The only stability problems we've had so far were when Sailfish OS was upgraded to Qt 5.2: Poor Maps broke entirely, but none of that was due to QtLocation, it was all due to "stable" modules. 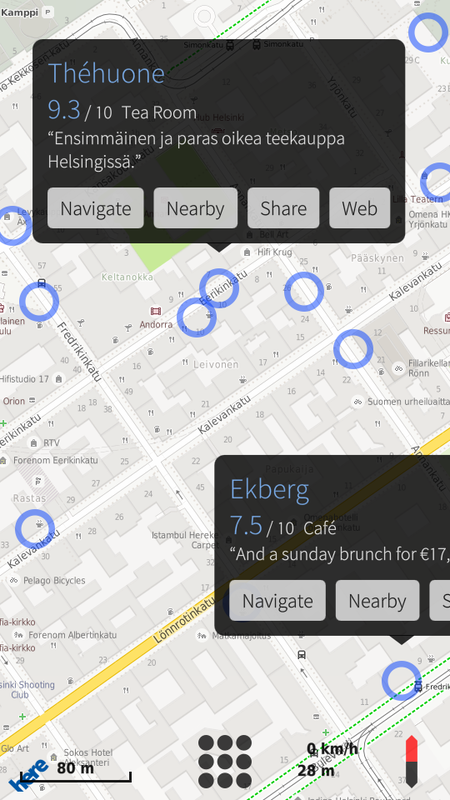 An update to this: QtLocation is a stable part of Qt 5.6. Qt 5.6 is also a long term support (LTS) release, which should suit users like Jolla/Sailfish well. So we just need Jolla (with their reduced staff) to migrate Sailfish OS to Qt 5.6, or, if possible, just pull that single QtLocation module from 5.6. An option to scale the map would be nice. Ie. currently the street names etc are written in such a small forn that one might like to zoom them bigger. Except it's not possible, the map zooms but text is still the same (tiny) size. I'll look into it, but note that simply scaling isn't much fun, it results in a lot of blockiness and blurriness. We need so called retina or hidpi tiles, which seem to be rare outside the big commercial providers. Compare double-scale openstreetmap.org tiles and @2x Stamen Toner tiles (the only free provider of these I managed to find). Looked into it. 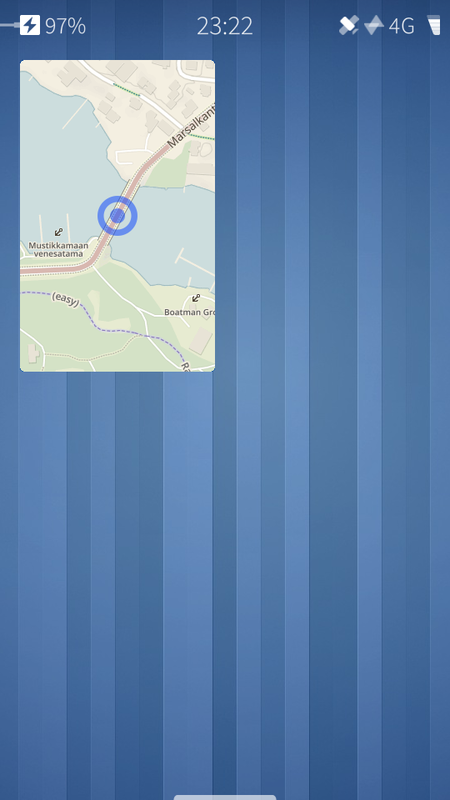 0.16 adds support for the so-called retina tiles, but doesn't add any maps that make use of it. We need to wait for tile providers catch up -- see e.g. Thunderforest Lightning, which will among other things bring "retina-scale raster tiles".